If you control another face-up WATER monster, negate the effects of the monster that battled with this card, after damage calculation. If this card would be destroyed, you can destroy 1 face-up Level ..
All Level 3 or lower Sea Serpent-Type monsters you control can attack your opponent directly. When this card is sent to the Graveyard for the activation of a WATER monster's effect: Add 1 Sea Serpent-.. While this card is face-up on the field, once per turn during your Main Phase, you can Normal Summon a Level 4 or lower Sea Serpent-Type monster in addition to your Normal Summon or Set. (You can only.. When this card inflicts Battle Damage to your opponent: You can Special Summon 1 Level 4 or lower Sea Serpent-Type "Atlantean" monster, except "Atlantean Marksman", from your Deck. When this card is s.. When this card is Normal Summoned, you can Special Summon 1 Level 3 or lower Sea Serpent-Type monster from your Deck. .. While this card is on the field, this cards name is treated as "Umi". Once per turn, you can select and remove from play 1 face-up Level 4 or lower Fish-Type, Sea Serpent-Type or Aqua-Type monster you..
Once per turn, you can equip 1 Level 3 or lower monster you control to this card. If you do, this card gains 800 ATK. If this card would be destroyed, you can destroy the equipped monster instead. (Yo..
Add to your hand 1 Level 7 or lower Ritual Monster Card from your Deck. Then you can add to your hand 1 Ritual Spell card form your Graveyard.. 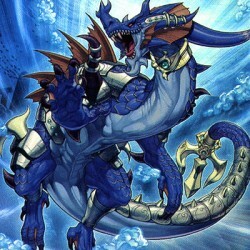 When an opponent's monster declares an attack: Target the attacking monster; negate that target's attack, and if you control any face-up Fish, Sea Serpent, or Aqua-Type monster, inflict 800 damage to ..
You can Tribute 3 Level 3 or lower WATER monsters; Special Summon this card from your hand or Graveyard. When you do: Return all Spell and Trap Cards on the field to the hand, and if you do, if 3 or m..